I’m a sucker for time travel books. In fact, there’s a trunked novel you won’t see mentioned under my writing tab. I wrote it before I had any idea what I was doing, and it happened to be an adult time travel romance. It was truly horrible, but like all first novels, I learned a lot from it. 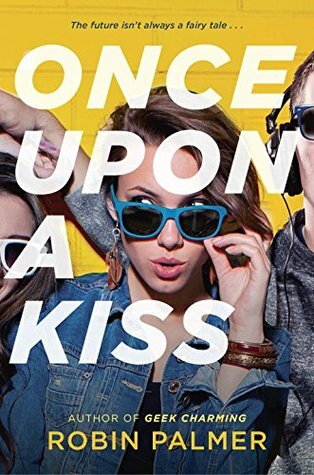 Recently I had an idea for another time travel story, and I might just write it eventually … but the point of this post is to rave about Robin Palmer’s ONCE UPON A KISS. It’s 1986 and sixteen-year-old Zoe Brenner’s world revolves around Depeche Mode, Judd Nelson, exercise-obsessed parents, and her best friend Jonah. Then one day, in a freak Fun-Dip choking accident, Zoe falls unconscious, and awakens in the year 2016. So much has changed, and Zoe needs Jonah to help her make sense of it all. But in this life, Zoe is the most popular girl in school, and she soon realizes this Zoe doesn’t associate with nerds like Jonah. As Zoe juggles new technology, attempts to hide her enthusiasm for poet blouses, and manages to keep her super jock boyfriend at bay, she tries to rekindle her friendship with Jonah and use her popularity for a good cause. Will she ever get back to 1986? And more importantly, does she want to? 1. The time travel – Yes, I already said I love time travel as a premise, but I liked the way it was done in this book. There’s just a freak accident, and everyone in Zoe’s life is displaced in a different year with different situations–except the characters still experienced a lot of the same childhood incidents for her to recall. It requires suspension of disbelief, but I was happy to go with it! 2. The friendships – The switch in Zoe’s circumstances force her to examine how she previously focused her entire life on Jonah. While that relationship was important and she’s fighting for it in the new reality, there are other people she’s overlooked, and she learns the value of expanding her circle. 3. The commentary on popularity – The groups may be different in 1986 and 2016, and Zoe may be at the bottom or the top, but she finds it’s equally hard to mix things up either way. Does she make a difference? Guess you’ll have to read the book to find out! 4. The pop culture – I was a child in the eighties–not a teenager–so the New Wave music references were lost on me (I need to go watch a YouTube video of “I Melt with You”), but the beauty of this book is that you don’t have to have experienced the eighties to enjoy the references. It’s not about nostalgia–it’s about experiencing the decade through Zoe and figuring out where she fits in. I really enjoyed it. 5. The humor – I was laughing throughout the book, mostly because of the situations. There’s a whole thing with a hot dog that’s crazy, but also because of the way it’s set up–like the popular kids being named after serial killers (Brad Bundy and Andrea Manson). Plus, Zoe’s parents make exercise videos, which was hilarious when it was Discosize in the eighties and even funnier when it’s Holla Your Way to Health in the present–like they’re always a bit behind the times. I’m definitely going to check out some of Ms. Palmer’s other books. If you’ve read any of them, let me know which one I should read next! This sounds like a really good one. I love time travel too and think it would be fun to watch her in 2016. Just requested this from the public library! I was in college in 1986, so I will get the vast majority of the references. Never watched much MTV, though. In college, in order to watch anything, I had to go to a lounge in another dorm building! Also, phones were all firmly attached to walls! MTV was so different then! I was a kid, so I didn’t watch much of it, but I recall it was actually *music* TV :). Enjoy the book!